(2) 20309 + 20308 on rear.
? Basford Hall Jn 06/04 ? 23/06½ 22/59 ?
? Madeley 06/11 ? 23/00 22/54 ?
? Norton Bridge 06/22 06/27½ 22/49 22/44 ?
? Trent Valley Jn 06/32½ ? 22/37 22/33 ?
? Bushbury Jn 06/48 06/49½ 22/23 22/21½ ?
? Wolverhampton North Jn 06/51 06/51 22/21 22/20½ ?
? Dudley Port 07/10 ? 21/57 21/55 ?
? Galton Jn 07/14 ? 21/51 ? ?
? Soho South Jn 07/18 ? 21/49 21/46½ ?
? Proof House Jn 07/36 ? 21/32 ? ?
? Landor Street Jn 07/37 ? 21/30 21/28 ?
? Water Orton 07/45½ 07/47½ 21/22½ 20/55½ ?
? Whitacre Jn 07/51 07/52 21/17 20/51 ?
? Nuneaton Abbey Jn 08/04 ? 21/03 ? ?
? Hinckley 08/18 08/21 20/52 20/29½ ?
? Croft 08/25 08/26 20/45 ? ?
? Wigston North Jn 08/36 08/31 20/37 20/18 ?
? Syston South Jn 08/54 08/55½ 20/11 19/55½ ?
? Sileby Jn 08/58 ?
? Ratcliffe Jn 09/15 ?
? Trent South Jn 09/25 ?
? Trent East Jn 09/27 ?
? Allington East Jn 10/12 ?
? Nottingham Branch Jn 10/16 ? - Manton Jn 19/37 ? - Helpston Jn 19/17 ?
? 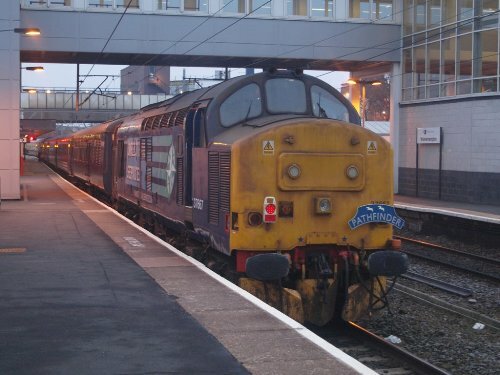 Peterborough East Jn 11/30 ? 19/05 ? ?
? Whittlesea 11/37 11/42 18/56 18/51½ ?
? March West Jn 12/03 ? 18/29 ? ?
? March 11/47 11/51½ 18/45 18.41 ~ 18.41½ ?
? 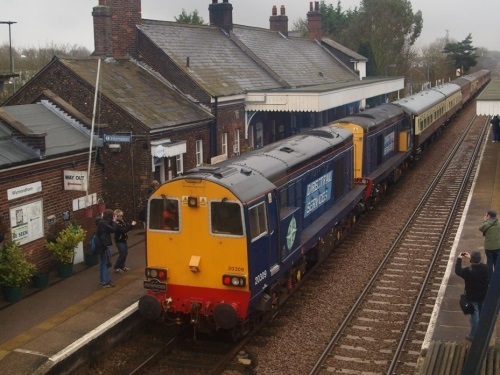 Ely West Jn 12/03 ? 18/29 18/25 ?
? Ely North Jn 12/04 12/05½ 18/26 18/22 ?
? Brandon 12/58 12/55 18/05 18/00 ?
? Thetford 13/07 13/02 17/57 17/54 ?
? Attleborough 13/23 13/15 17/42 17/41½ ?
? Trowse Jn 13/51 ? 17/19 17/18 ?
? Trowse Swing Bridge 13/52 ? 17/18 ? ?
? Thorpe Jn 13/52½ ? 17/17½ ? ?